Picking up a Miranda Kenneally book is like visiting old friends, literally. What I love about her Hundred Oaks series is that even though each story is completely its own, we still get a glimpse at past characters from her previous books. It's always nice to see what they're up to and how they've been. The latest installment of this series is another win for me. I really enjoyed the easy pace of this YA book and how it gives just enough depth to propel the story forward, but still keeps it light and fresh. Annie is training to run a marathon in honor of her boyfriend who recently passed away. She knows this is going to be the hardest goal she has ever set for herself, but through the pain, she's also hoping it will give a sense of closure to a devastatingly broken heart. While she's on the course, training one day, she meets Jeremiah; a reckless, adrenaline-junkie who speeds past taking all the air from her lungs with him. What begins as a crazy impromptu hook-up quickly slams to a screeching halt. Annie is in no way ready to be back in a relationship with someone, she needs to focus on the marathon and starting college in the months ahead. The slow build between Annie and Jeremiah was definitely my favorite aspect of the story. Their chemistry was immediate right from the start. But even though Annie put the breaks on their love affair, she couldn't deny herself the friendship that was blossoming between them. As the story progresses, so does the growth of Annie's character as we see her evolve and conquer mile after mile. This a story about facing hardships in your life, and learning how to overcome fears because of them. Annie is a strong, determined character who deserves finding hope again. You can't help but want to cheer her on at the finish line! I have a confession. I've never read anything by Miranda Kenneally. I Know!!!!! I will have to make time ASAP. Glad you liked this. It seems sort of sad. I also haven't read anything by this author! I've been on the fence about this book and whether I want to add it to my list. I love slow build romances. Glad to see you enjoyed this one! Lovely review, G! I feel the same way about her books - I love visiting old characters, and it makes me happy that Kenneally lets them all have happy endings. Jere was so freaking adorable; so so patient with Annie and a true gentleman. Loved the direction their romance took. Every single time I read a Kenneally book, it always feels like I've come home for a visit. It's nice seeing familiar faces & places, as well as being introduced to a new character to love with every book! 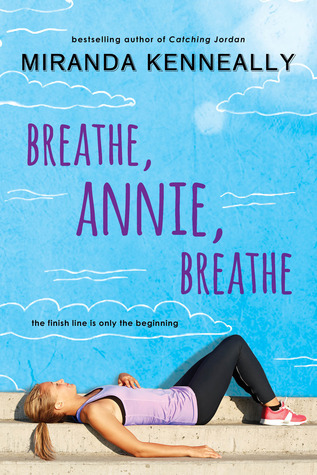 Breathe Annie Breathe was seriously a wonderful read, and I'm totally a fan of Annie's and Jeremiah's!